An earlier version of this story was corrected for Lillian’s online schooling on Tuesday, May 10. 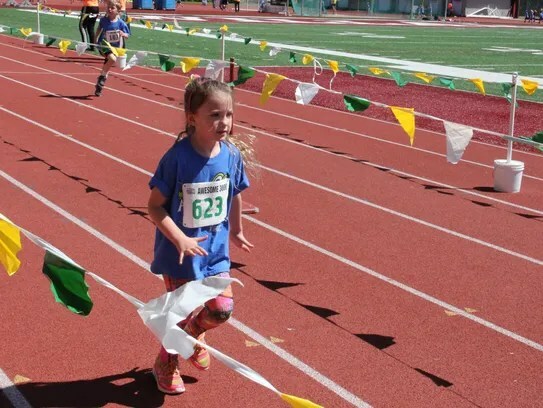 Lillian Duchateau, 6, did two one-armed push-ups Saturday morning to prepare for her first Awesome 3000 run. Just after, she fueled up by eating a bowl of her favorite cereal, Captain Crunch. She said she was ready to beat the boys. She was sporting bright, multi-colored leggings that matched her bright pink headband. Before the race, she stretched with her friends and listed to the volunteers leading the warm up. Lillian goes to school online through Oregon Virtual Academy and to the Zena Springs Farm School in West Salem. 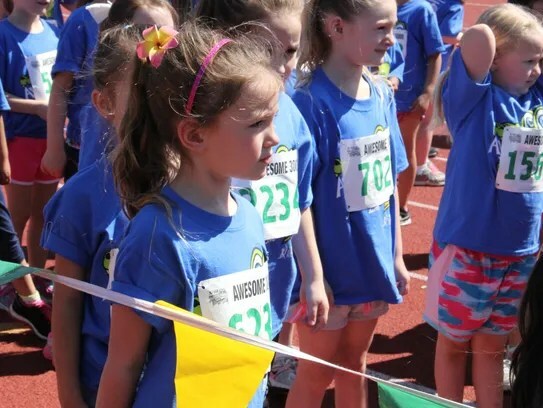 Her grandparents, aunt and cousins came with her mom to cheer her on. “I love running everywhere,” she said. “I like to win!”Lillian jumped up and down while she held her mom’s hand, excited to run. She said the run on Saturday was hot, but really fun. She ran the whole time and she proudly showed her medal, continuing to smile and jump up and down with excitement.